As I mentioned in my previous post, I asked my coworkers to help me choose baking projects for the summer. Several of the recipes that I included on the list were elaborate (for me) layer cakes, and somewhat surprisingly, my coworkers seem to be really big on layer cakes. 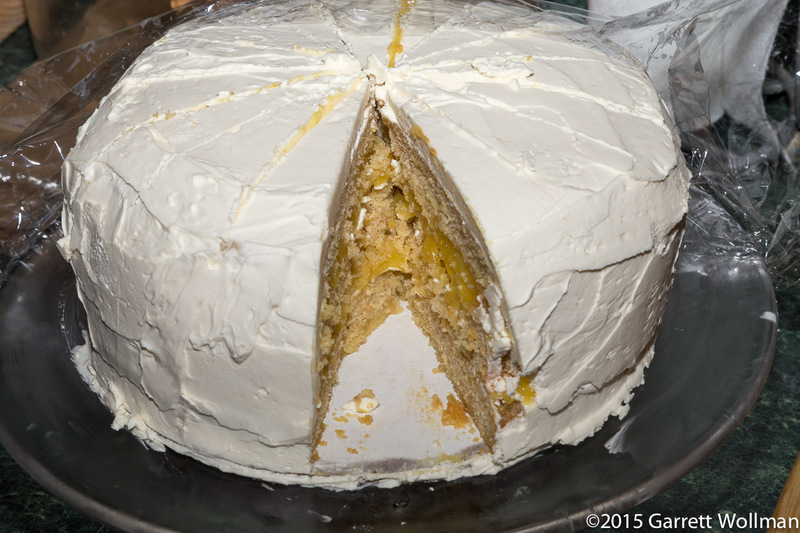 Only one person asked for “Daffodil Cake” (from King Arthur Flour’s Whole Grain Baking , p. 404), which I had to describe to several people when I was passing my list around: “It’s a whole-wheat layer cake with a lemon curd filling and buttercream frosting” was about the best I could do. I couldn’t even explain why it was called “Daffodil Cake” (although it seems obvious in retrospect); one person even mentioned how daffodils were poisonous, and why would you name a cake after a poisonous plant? At this point, I had baked exactly one layer cake in my life — also a genoise, but chocolate, with a chocolate ganache frosting, and I think also filling. (Hey, I like chocolate, and I did it for my own birthday — what can I say?) “Daffodil Cake”, although or perhaps because it was fairly complex, seemed like a good cake to try out on a weekend that I knew would be a partial wash-out otherwise. Simple syrup is pretty simple to make: just boil equal volumes of water-type liquid together with sugar. In this case, it’s 1 cup of sugar, ¾ cup of plain water, and ¼ cup of freshly extracted and strained lemon juice. 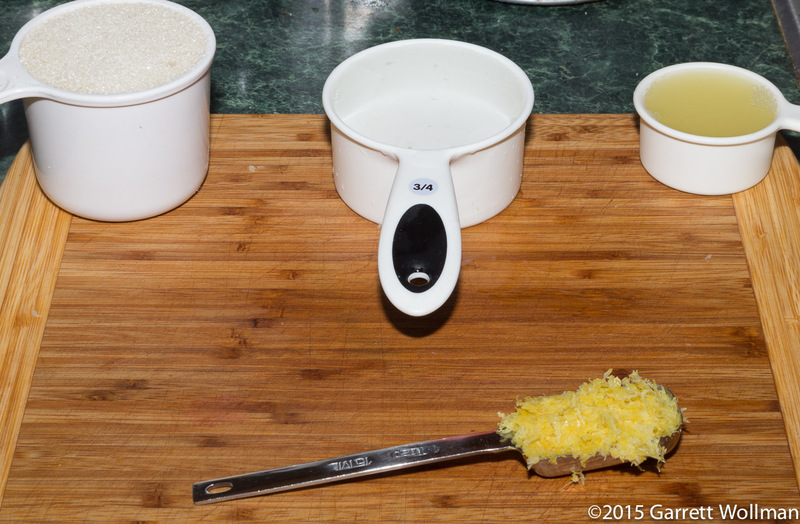 Optionally, one could add a tablespoon of lemon zest, which I did during the cooking process, but strained it out at the end so the syrup would not have bits of zest in it. This recipe makes a bit more syrup than is actually required for the cake. The same formula works for orange flavors as well. Once prepared and cooled, the syrup can be stored in the refrigerator. 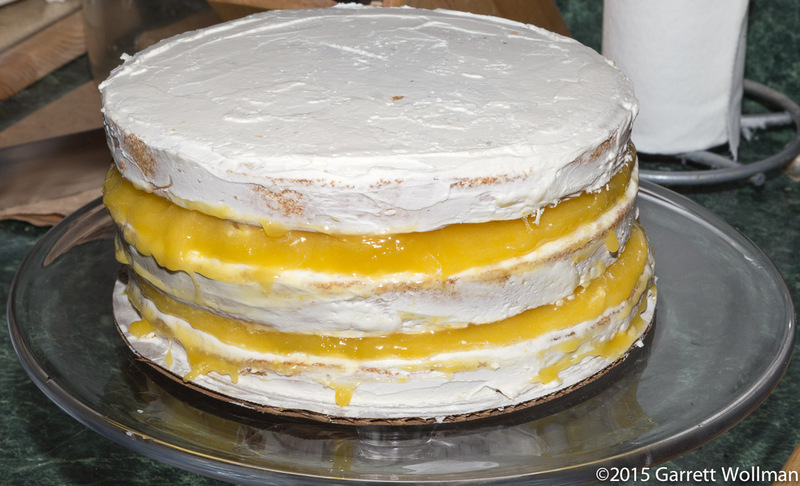 I completed both the syrup and the lemon filling on Saturday evening, then started making the remaining phases of this cake on the following, rainy, Sunday afternoon. 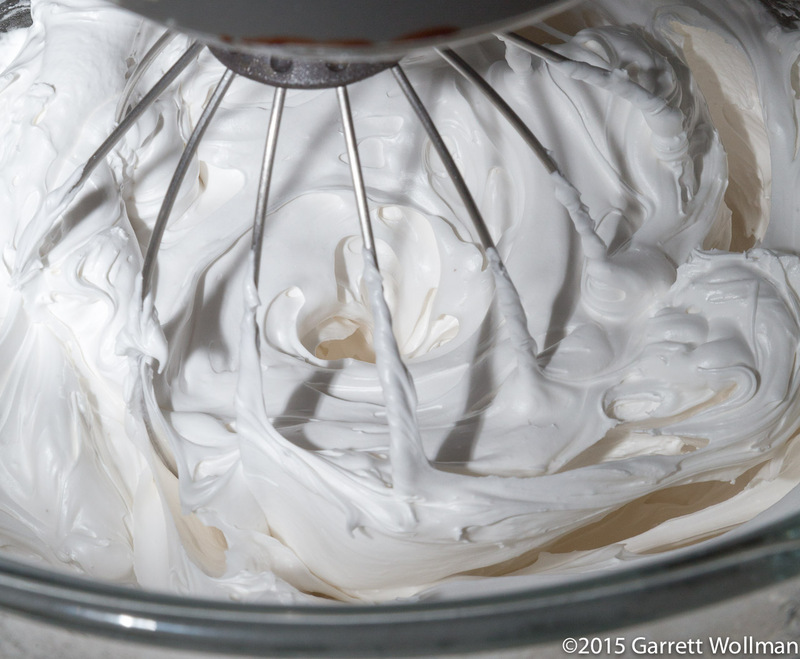 A buttercream — a proper buttercream — is based on a meringue. That means “fluffy whipped egg whites”, and fluffy whipped egg whites mean “scrupulously clean mixing bowl”. For this reason, I decided to do the buttercream first, so that I could get the meringue out of the way, and wouldn’t have to worry about how well I washed the bowl after making the cake batter. 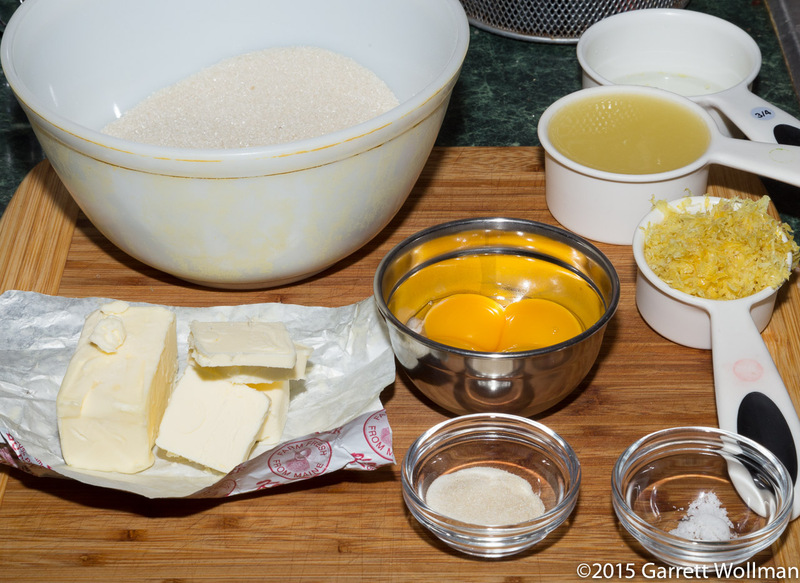 Buttercream is made of four components: the meringue I just mentioned, which is just egg whites, salt, and cream of tartar; a sugar syrup (more concentrated than the simple syrup above, cooked to the “soft ball” stage); the fat; and flavorings and colorants. When properly made, uncolored buttercream is a bright white color (although not quite as bright or pure white as the meringue base). 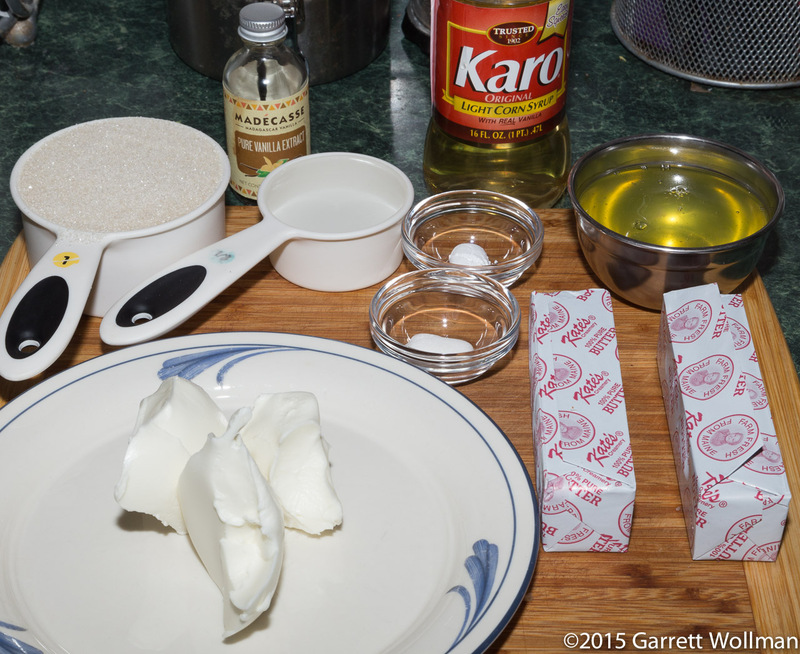 The corn syrup, sugar, and water are used to make the hot syrup, which is added to — and cooks — the meringue. The fat, in addition to the half-pound of butter, includes some vegetable shortening — unusually for a cookbook with a title like Whole Grain Baking . The shortening I used is an organic, trans-fat free palm-oil shortening, so it’s about as un-horrible as shortening can be, but it’s still shortening. I used it in this case because the recipe strongly recommended it, although they do admit that you can use all butter, too — the higher melting point of the shortening helps to keep the finished buttercream firmer at room temperature. So this is the meringue. 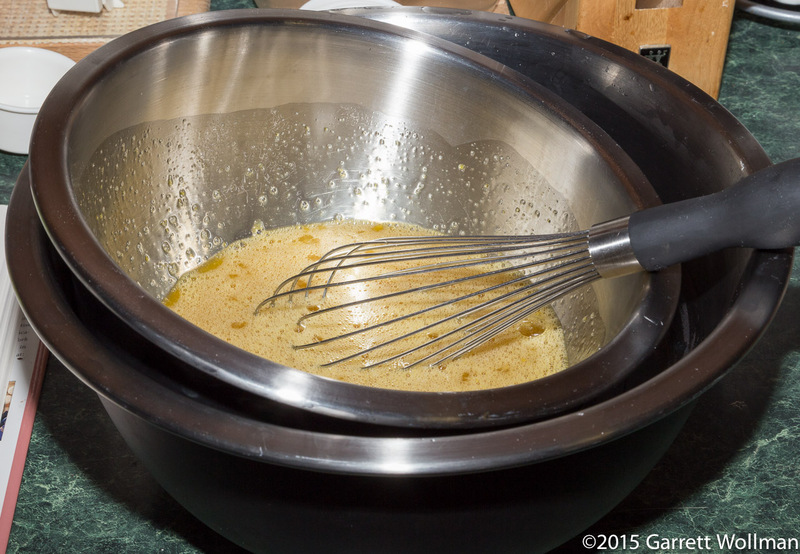 Four egg whites can whip up to a lot — this is a six-quart mixing bowl, I think, so that gives you some idea. I actually don’t recall whether this is before or after adding the sugar syrup; the texture and glossiness makes me think “after”, however. King Arthur’s method is to stop the mixer and pour a fraction of the syrup down the side of the bowl, then whip until incorporated, repeating until all the syrup is mixed in. (Contrast Alton Brown’s method, which I had done before on some occasion or other, which involves using a hard-to-find metal bulb baster to carefully deposit the syrup between the tines of the whisk and the side of the bowl.) The process doesn’t look any different from this point on: the meringue must be whipped continuously until it cools back to room temperature (this takes 15–20 minutes), at which point the softened butter (mine wasn’t quite soft enough, I later realized) and shortening can be incorporated, along with any flavorings. 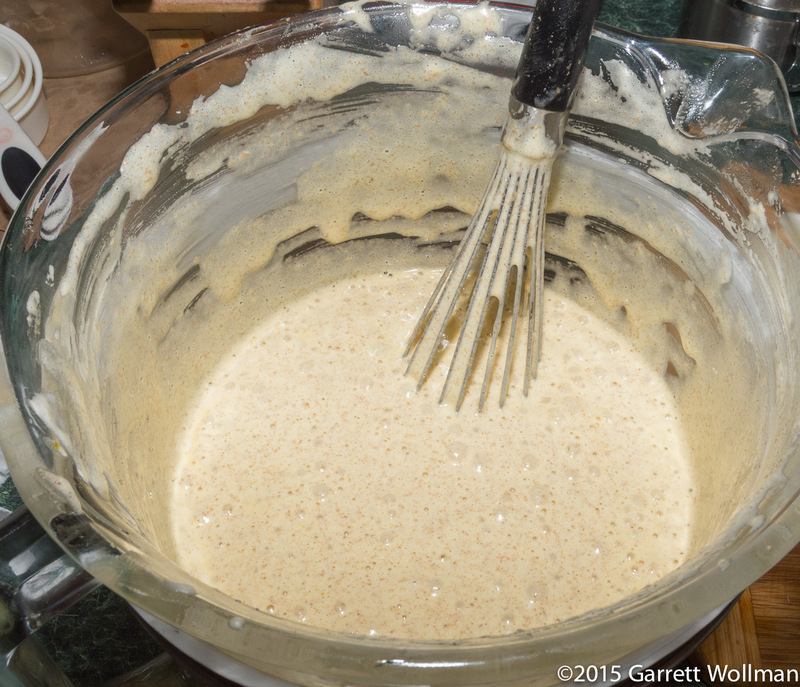 Finally, it’s time for the whole-wheat genoise. 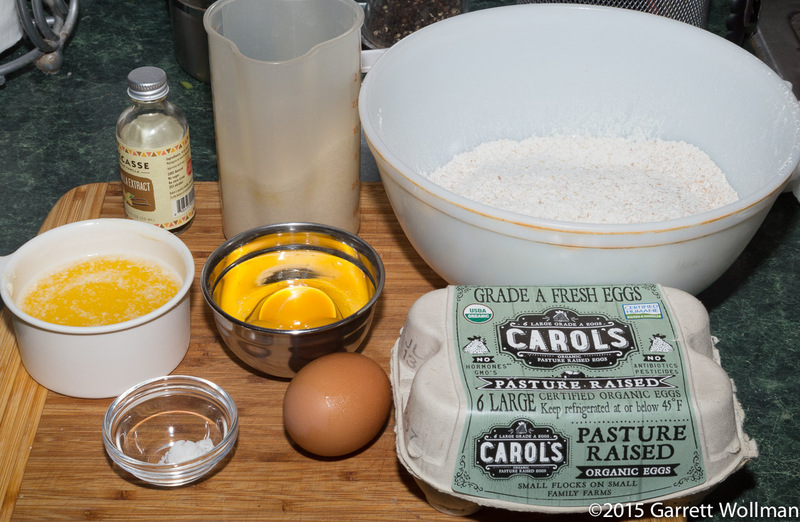 The batter is also based on an egg foam, although this time it’s made from whole eggs — compare some of the brownie recipes I made earlier this month — which is then stabilized with flour and then enriched with melted butter. (A true “butter cake” would have twice as much butter as is shown here: that’s just one stick, melted.) This genoise has seven whole eggs and three egg yolks (I froze the leftover whites for another day), and because it’s a whole-wheat genoise, the flour is whole-wheat pastry flour (aka “Graham flour”) mixed with a small amount of all-purpose flour. Salt and half a pound of sugar complete the egg foam. 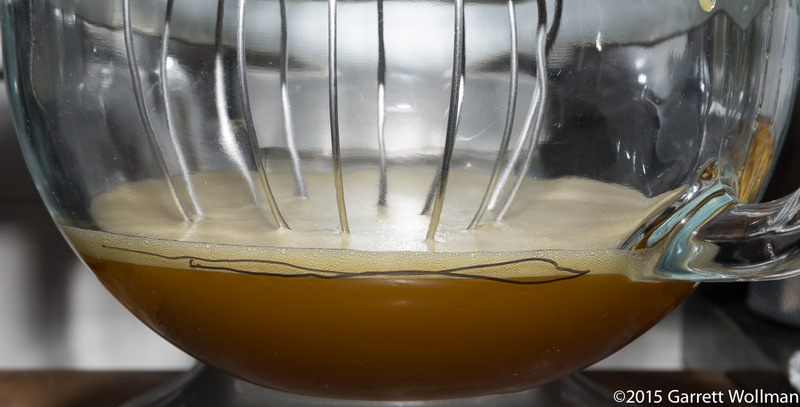 This is what’s called the “ribbon stage”: the egg foam should form ribbons as it falls off the beater. 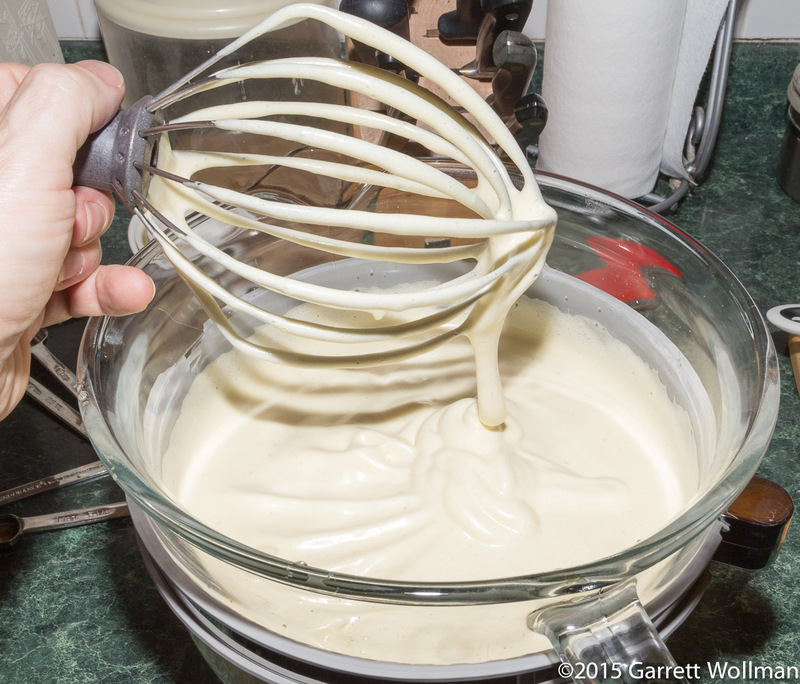 Some genoise recipes do this part all by hand, with a regular whisk, over a double boiler — I’m not sure I have the patience for that! After folding in first the flour and then the melted butter, the egg foam collapses to about half its former volume. 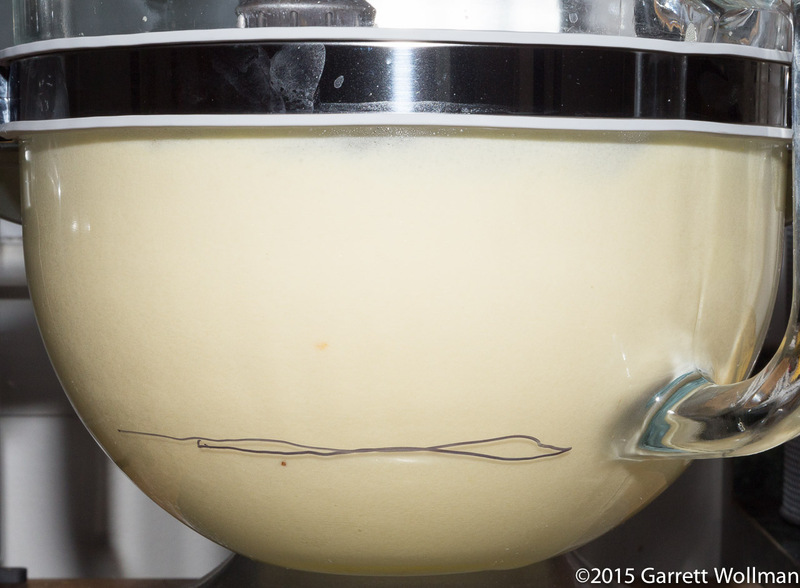 You can see how tall it was by the batter that’s up on the whisk handle — no more. When they were fully baked, I took the layers out to cool on a rack. 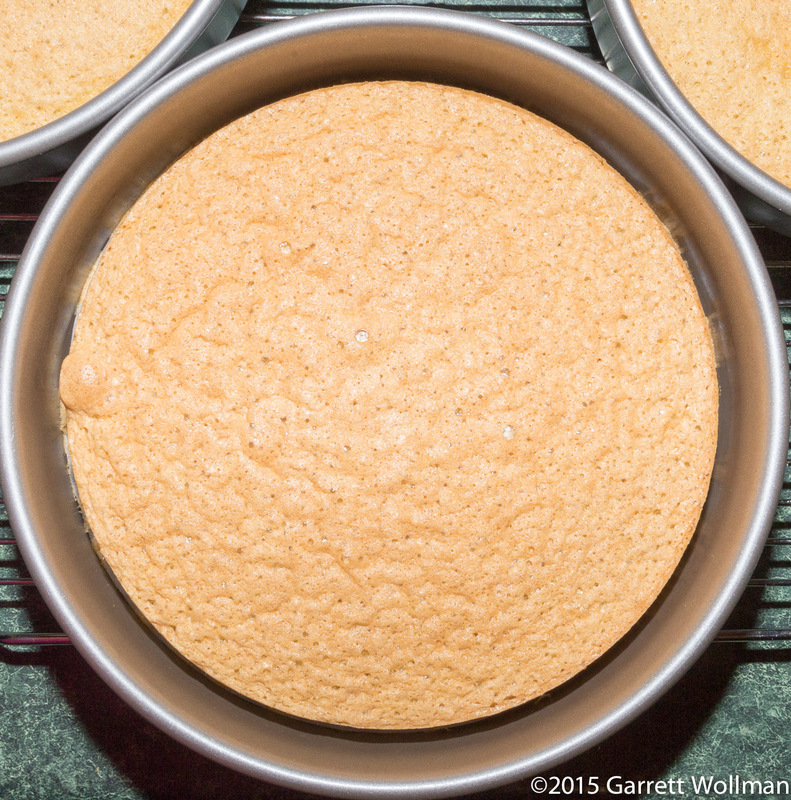 You can see some of the texture imparted by the whole-wheat flour in the tops of these cakes. 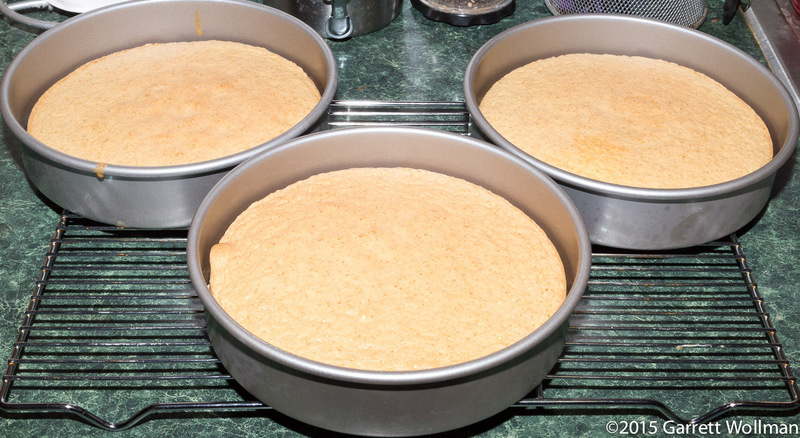 I was a little bit surprised by how much the cake layers pulled away from the sides of the pans as they baked and then cooled. While the cakes were cooling, I went out the the store to buy some cardboard cake rounds to use in the next part of the process. Many of the layer-cake recipes in Whole-Grain Baking link to a common construction process for genoise layer cakes, which starts with slicing the top crust off the layers; I did a particularly egregious job of that, as you can see here. If I had thought of what I was doing as “leveling” rather than “scraping the crust off”, I might have done a better job, and had a nicer-looking cake at the end! After the layers are leveled, they are brushed with two tablespoons of lemon simple syrup on each side (thus, using ¾ cup for the whole cake, leaving ¼ cup left over for some other purpose), and then they go into the freezer for an hour (I used the cardboard rounds to keep them flat in the freezer, although I just realized I could have reused the pans for that). King Arthur’s common directions for layer cakes assume that you’ll be filling the cake with frosting, and so they have you crumb-coat the individual cake layers and then put them back in the freezer for half an hour. I did this, but realized in retrospect that it was a mistake, and for a cake with a curd filling you probably shouldn’t do that (and didn’t need to do that anyway, since it hardly matters if the filling gets crumbs in it). Mistake made, I was ready to actually complete the assembly of the cake. 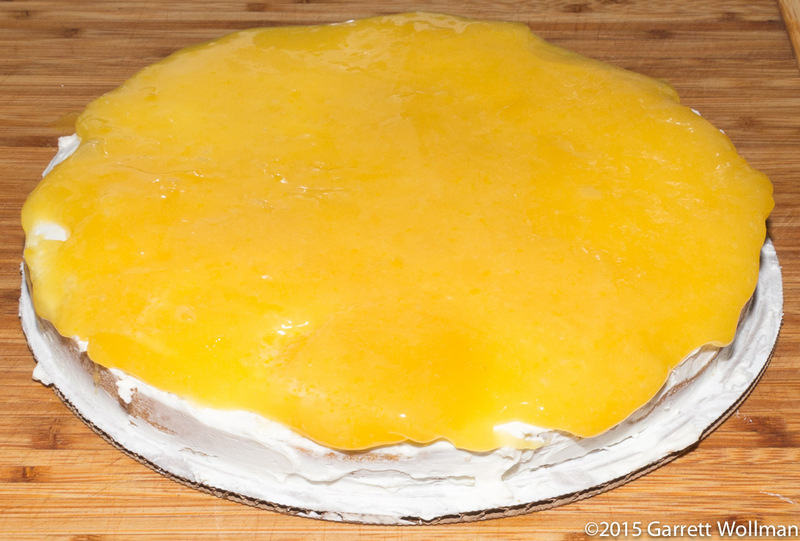 Another mistake: I spread the lemon curd — with some difficulty — all the way out to the edge of the layers. I should have left some margin around the filling so that it wouldn’t poke through the frosting; I ended up — after the cake was assembled — going around the layers with a finger to smooth out and remove excess filling from the cake so I could actually apply the frosting. And now with the cake assembled you can really see what a lousy job I did leveling the layers. I suspect my oven rack isn’t especially level, either, and I should probably have been a bit more aggressive about rotating the layers while baking so they would stay level. I deliberately chose the “runt” layer to be the bottom; maybe I should have put it on top instead. That’s also clearly too much filling for the size of the layers, which during service would cause the layers to start slipping apart. (What is this, mistake #4 now?) But now you can start to see why it’s called “Daffodil Cake”: white on the outside, yellow on the inside, like the flower. 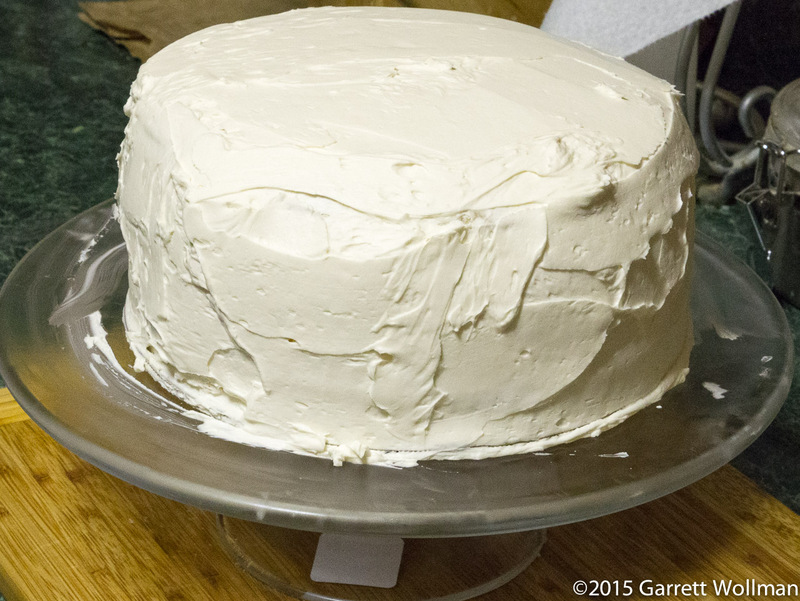 Yeah, that’s a really sloppy job of frosting. I was pretty tired at this point, and I didn’t have a cake comb or the right size spatula to clean it up properly. Didn’t even cut myself a piece! And of course the obligatory cross-sectional view. Overall: the cake was OK, not fabulous, but good enough. I made a bunch of mistakes, which just goes to show that I need more practice. Next time up will not be a genoise, but I haven’t decided what it actually will be. There are plenty of choices. I’ll give two separate nutrition labels here, one for the buttercream and one for the whole cake, both assuming that the cake will use an entire batch of frosting and that the cake will be cut in 16 slices. 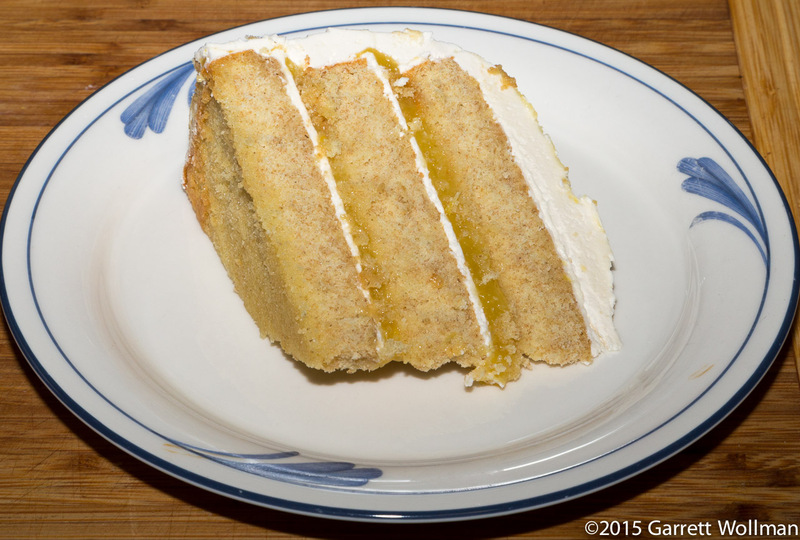 Gallery | This entry was posted in Food and tagged buttercream, cake, genoise, King Arthur Flour, layer cake, lemon curd, recipe. Bookmark the permalink.